The cost of electric vehicle charging station equipment has decreased in recent years and the cost of installation should decrease as installations become more common for electricians. The 2017 State of the Charge Report forecasts that the EV charger market will increase at 50% a year through 2025, which should drive costs down. The cost of an EV charging station can vary significantly based on the requirements and current electrical infrastructure, but averages ~$1,000 all-in for a Level 2 home charger. This guide details the cost of EV chargers for home and also discusses the cost of Level 2 chargers for business and Level 3 (DC-fast charging) stations. Many consumers tell us that it can be difficult to find electricians with specific EV charger experience. It may be worth checking out Amazon Home Services EV Charger Installation (the reviews have been excellent so far). Use a Level 1 Charger (Free) – All EV models come with a basic chord that will plug into a 120V outlet, which is the standard outlet for homes in the U.S. Assuming you already have a 120V outlet in your garage, this option is essentially free. This set-up will only allow for charging rates of 3-5 miles per hour, so if you have a moderate commute, a faster charge is required. Purchase a Level 2 Charger (~$1,000) – Most EV owners elect to purchase a Level 2 EVSE, which stands for Electric Vehicle Service Equipment, for use in their home. The Level 2 chargers require a 240V outlet (NEMA 6 which many clothes dryers use). The cost of a Level 2 charging station is typically around $1,000 all-in, which includes the equipment and installation cost. There are a range of Level 2 models (read our detailed EV charger model review) and costs, which we discuss below. If you are interested in electric car charging stations for your business or retail location, please refer to the section on Level 2 charging stations for business or read our detailed review of these products. 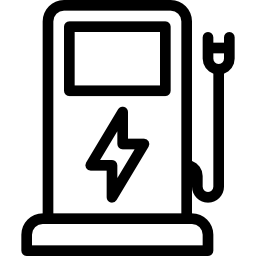 There is also the option for businesses to purchase DC fast charging stations (also called Level 3), but the cost of a Level 3 EV charger is significantly more and is typically purchased through one of the EV charging network providers. 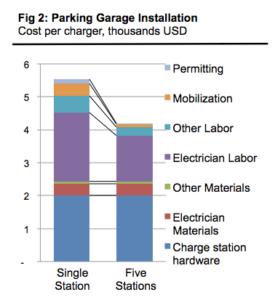 The majority of the cost of a Level 2 EV charging station (approximately $1,000 all-in) is the actual equipment itself with the installation (electrician labor) accounting for the remaining portion. Level 2 EV chargers that are fixed to a wall range in cost from ~$350 for a non wi-fi connected model (the Siemens Versicharge) to ~$600 for a wi-fi model (Chargepoint or JuiceBox) with other bells and whistles. There is also an option that is slightly less expensive than the $600 wi-fi models – that is a portable Level 2 charger. The cost of a portable Level 2 charger is typically under $400 and the most popular model is the AeroVironment TurboCord. These can be a helpful option if you want to plug into an outlet at a friend’s house or a public station that has only the 240V outlet. The cost of an EV charger installation is typically approximately $500 and can vary based on the distance from the installation point to the breaker or service panel. The installation cost can also increase by approximately $500 if the service panel needs to be updated. The service panel may need to be replaced if you have an older home. Refer to the section on detailed cost breakdowns to understand what requirements could increase the cost of installation. The chart below includes the prices of the most popular EV chargers available as of December 2017. The installation cost data is from a study by the Rocky Mountain Institute, a leading cleantech institute, which broke the installation cost down into electrician labor, materials, permitting and mobilization (traveling to the installation location). The study was completed in 2014, so please note that we have adjusted the EV charger equipment cost in our estimate as prices have come down. The cost of a Level 2 charging station for a business (retail or corporate location) can be significantly more than a home charger at over $5,000 for the equipment and installation. The equipment can cost between $2,000 and over $$5,000 – for more details refer to our detailed review of EV charging stations for business. The equipment is more expensive as they are typically pedestal mounted and come with additional features including LCD screens, payment processing and other data tracking features. Most of these models also come with at least two charging ports. According to RMI, the installation for Level 2 chargers for businesses is the largest component of the cost and can be between $4,000 and $7,000. If the charger is located in a public parking garage the installation cost will be less than a curbside installation as the charger can be wall mounted and wiring is easier. A curbside charger is typically free-standing and trenching or directional boring for wiring increases the installation cost. The investment in an EV charger for businesses can be quickly returned through an increase in retail traffic and many companies are pursuing opportunities for retail placement (including a combination of solar/EV stations). A Level 3 or DC fast charging station are typically installed through one of the EV charging station networks and can cost more than $50,000 to install. The main contributors to the increased cost are both the equipment and installation. The installation can require a 480V transformer and the electrician labor hours can be greater than 40 hours. The chart below details the costs for Level 2 home chargers, Level 2 chargers for business and Level 3 chargers. 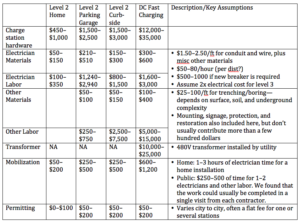 As noted by RMI, installation rates for home EV chargers can fluctuate based on the electrician labor time at $50-$80 an hour depending on the location. A new breaker can also increase the price by $500-$1,000. Commercial installations have a wider variance based on the current electrical infrastructure and the extent of trenching/boring required.